It’s the season of giving, and Good Chemistry wants to show our appreciation by offering a special limited time price on the finest Cannabis in Colorado. 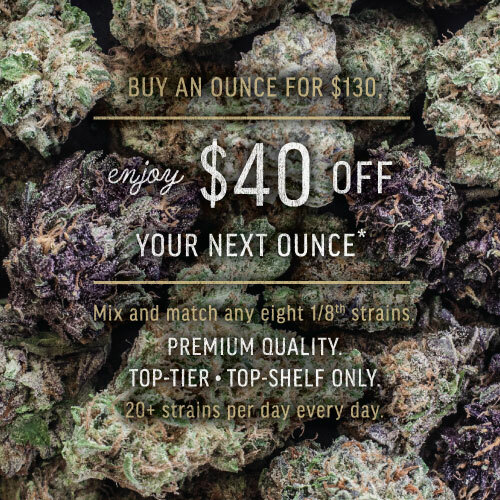 Starting today, buy an ounce at our regular $130 price and enjoy $40 off your next ounce. Good Chemistry offers only premium, top shelf Cannabis only – no tiers or tier pricing. Choose from our full selection of strains with 20 + strains in store every day. Stick with your favorite strain, or mix and match eight different strains up to a full ounce. Growing the world’s finest Cannabis takes deep experience and a personal commitment to making the benefits of exceptional cannabis available to the widest possible range of people. Our master growers have been perfecting their art of over 20 years. They combine skill, fascination, a thirst for continual learning and improvement. Please stop in to any of our three locations and let us thank you for all of your support this year with this special offer – Buy an ounce at our regular $130 price and enjoy $40 off your next ounce.